Daily Illuminator: Munchkin Shakespeare Kickstarter: Final Week! March 3, 2017: Munchkin Shakespeare Kickstarter: Final Week! We're approaching the last act of Munchkin Shakespeare, and we've got a lot of cool stuff to reveal before we take our final bow next Friday, March 10. The $200,000 mark has been broken, unlocking a Munchkin Shakespeare Coloring Book for the Kickstarter Exclusive Expansion. This journal-sized coloring book will go nicely alongside The Munchkin Alphabet and 12 Days of Munchkin Coloring Book. 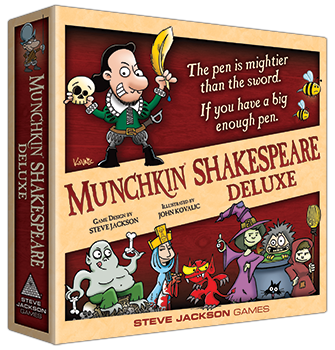 We also revealed what many fans have been clamoring for: a stretch goal to turn Munchkin Shakespeare into Munchkin Shakespeare DELUXE! If we can reach $275,000, every backer's game will be upgraded with a board and standies. And we didn't stop there! We've added a new Facebook post to our Audience Goals, allowing backers to unlock more cards and even glow-in-the-dark pawns for the expansion! You can help, too . . . just share the post! We're not resting on our laurels, and we hope to make this final act a show-stopper! Who knows? Maybe even more surprises are waiting in the wings . . .
* Note: Box art not final.